If you’re thinking about having a dental implant procedure, you should consider all of the details involved and have a deep understanding of the process. All In One Dental Innovations seeks to provide this insight through the detailed step-by-step guide below. After identifying the reason (or multiple reasons) behind why you need a dental implant, the next stage is to find the right dental health professional fit for your surgery. A dental implant operation is no simple ordeal and should only be executed by qualified individuals with years of experience. For instance, there are different types of implants–those installed in the jawbone (endosteal) and those that rest above the jawbone deep within the gums (subperiosteal). Consulting with a skilled dentist is crucial to ensuring a safe, successful implant procedure by first determining the best implant type suited to your body. Patients with shallow jawbones typically require the subperiosteal type of implant which is also the least common. Some risks associated with dental implants, in general, include nerve and bone damage–these risks are increased when dealing with shallow jawbones. Failure to identify the proper implant type for a patient or to have the procedure executed by a trusted professional might result in the drilling of the implant too far into the jawbone or the instability of the implant within the gums. This is why finding a dental surgeon with the right combination of expertise and experience is vital to ensuring your safety as well as the success of the implant. The particular composition of an implant typically depends heavily on the patient and the preferred technology used by your dental surgeon. Although materials may vary, the structural design of a dental implant usually remains the same and can be broken down into three parts–the root, crown, and abutment. The “root” of the implant is meant to mirror the shape and functions of a natural tooth. Meant to act as the post and base of a tooth implant, the root needs to be composed of extremely durable materials. In most cases, the root is primarily made of titanium in the shape of a screw to be tightly sealed into the patient’s jawbone. This screw is often coated with a substance that stimulates quick bone-regeneration so that the jawbone can quickly heal perfectly around the root and hold it in place. The crown of the implant is often composed of porcelain or metal and gives a similar shape to a natural tooth. Porcelain crowns allow patients to restore their smile without drawing attention to the fact that dental work was ever done. These artificial crowns are also beneficial in that they last longer than natural teeth and won’t easily be susceptible to damages. Implant crowns are often coated with a protective sealant that also works to prevent staining if properly maintained with regular care. 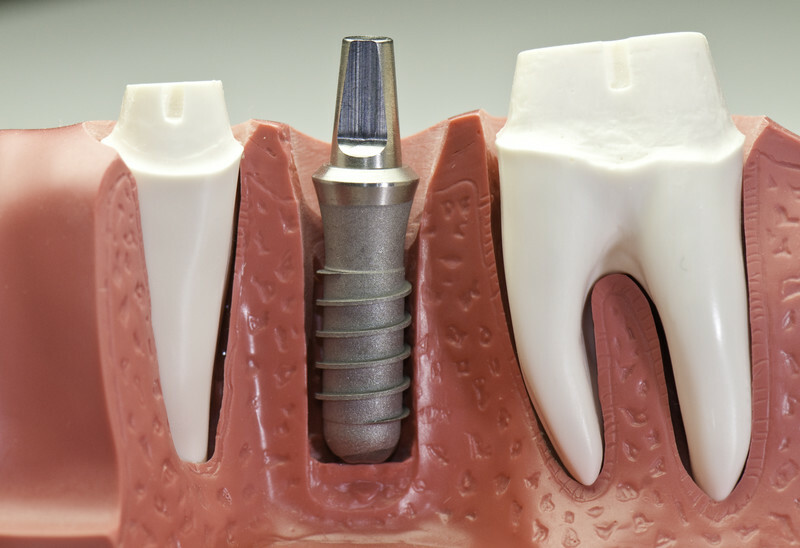 An abutment piece is the connector part of the dental implant that joins the root to the crown. The abutment is often composed of either gold, porcelain, or titanium and rests just above the gums. This part of the tooth implant is securely screwed into the post or “root” of the implant that rests below the gums and in the jawbone. The abutment is an important component of the implant that ensures greater stability of the crown and the ability for the gums to naturally heal around the implant. Prior to providing any dental implant services, your dental health advisor will consult with you to discuss hygiene and dietary actions necessary to be executed prior to the procedure. Most patients won’t be able to eat close to the time of their operation because it will interfere with the anesthesia that will be provided during the surgery. Along with following their dentist’s dietary recommendations, patients will also be required to use a special mouth rinse, in some cases, or prescribed medication to provide healthy conditions for the surgeon to operate under. Your doctor will also run through the procedure with you to clear up any last-minute questions or concerns you may have in order to ensure your comfort and confidence in the implant surgery before the actual operation day. After the patient is provided with a local anesthetic or IV sedation, the dental surgeon will work to remove any damaged teeth from the area where the new implant is to be placed. If no bone grafting is needed in the jawbone, the oral surgeon will then drill a space into the jawbone where the metal post (root) of the implant will be placed. In some situations, the abutment can be installed onto the post right away and the gums are resealed over the implant to heal over a period of months. Depending on the surgeon and the patient, a temporary crown can be placed on the abutment and replaced with the permanent crown later on or the doctor will wait for the tissue to heal around the abutment portion of the implant before adding any type of crown. A dental implant procedure spans over a period of months and is dependent on a number of factors including the necessity of bone grafting, the patients healing rate, the type of implant, and other impactful variables. Permanence: Implants are permanent and don’t have to be put in or removed every day like alternative options (dentures). You can rest assured knowing your smile isn’t going anywhere and is completely yours. Natural-looking: With dentures or bridges, you can sometimes immediately tell that a smile is artificial. Dental implants, however, provide a natural-looking smile that no one will question as being fake. Structurally Strong: Unlike your natural teeth, the components of an implant won’t easily decay or face simple damages. So long as they are properly cared for, implants can last a lifetime with little ongoing maintenance. Functional: Although dental implants are composed of materials different from natural teeth, they still provide the same functionality in allowing you to eat and speak normally. Safe: The dental implant procedure is fairly safe when executed by a qualified professional and ensures patients don’t have to make high risks to achieve their dream smile. Little Pain: Dental implant surgery also results in minor pain throughout the healing process that will quickly diminish over time and can be combated with simple medication like Tylenol or Advil. If you are still curious about the dental implant process and would like to know more, feel free to reach out to the All In One Dental Innovations office at (925) 828-9811 to consult with one of our dental health experts! You can also request an appointment online.